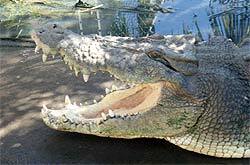 Unlike birds and mammals, crocodilians are unable to maintain a constant body temperature by physiological means. For this reason they are referred to as being "cold-blooded". Crocodilians have a "preferred" body temperature of around 30-33C, and to achieve such temperatures they move back and forth between warm and cool parts of their environment. In cold weather they bask in the sun to heat up, and in hot weather they seek shaded, cool areas to avoid overheating. Basking crocodilians will usually orient themselves so that the maximum body surface is exposed to the sun. However, as they warm, they often face the sun, thereby reducing heat uptake by the relatively small head, whilst the body continues to heat up. When oriented in this way crocodilians will often open their mouths, allowing the brain to cool through evaporative cooling, while the rest of the body is heating. This "mouth-gaping" posture, however, is also a behavioural display, used even at night, or when it is raining. 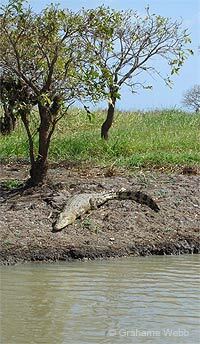 Behavioural body temperature regulation limits the extent to which crocodilians can live in cold areas. Nonetheless, it is remarkable, how crocodilians can withstand prolonged periods of cool weather without requiring food for temperature regulation.